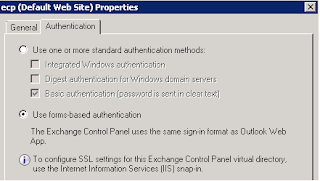 Proxying requests between two Exchange 2010 Client Access servers enables organizations that have multiple Active Directory sites to designate one Client Access server as an Internet-facing server and have that server proxy requests to Client Access servers in sites that have no Internet presence. The Internet-facing Client Access server then proxies the request to the Client Access server closest to the user's mailbox. 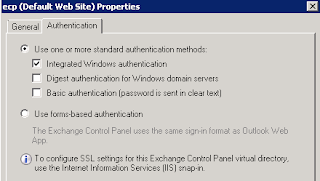 Remark: In each Exchange organization that wants to allow access from Internet-based clients, at least one Active Directory site must be Internet facing. All non-Internet-facing Active Directory sites rely on the Internet-facing Client Access server or servers to proxy all pertinent requests from external clients. I will setup the following lab environment. Assuming “Default-First-Site-Name” is the Internet-facing site. I have created 2-mailbox (Susan Tam and Peter Pan). Susan Tam mailbox stores in “EX1.contoso.com” and Peter Pan stores in “EX2.contoso.com”. Solving this problem, I have to configure the Client Access Server proxying. 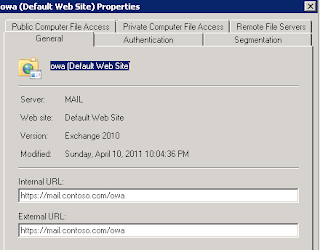 “Mail.contoso.com” will be the Internet-facing Client Access Server. 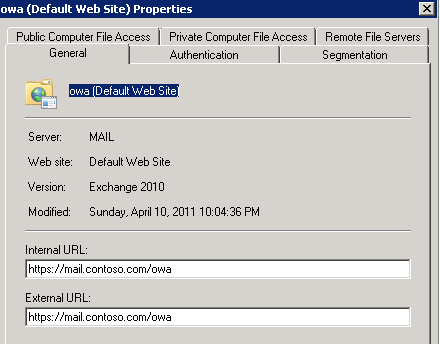 After I configure the internet-facing Client Access Server, all users will use “https://mail.contoso.com/owa” to access their mailbox. 1. 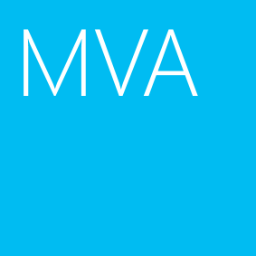 At Mail, log in as Domain Administrator. 2. 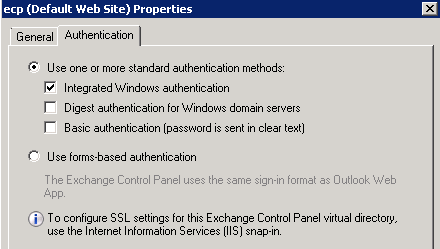 Launch "Exchange Management Console", expand "Microsoft Exchange On-Premises > Server Configuration > Client Access". 3. 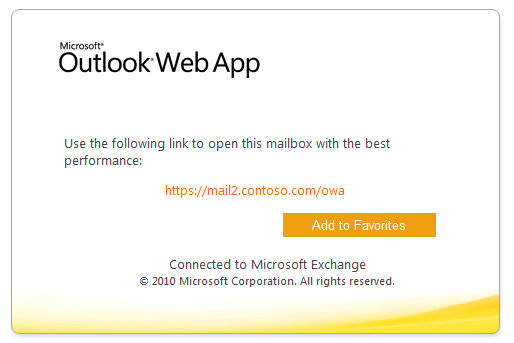 At right pane, select "MAIL". 4. 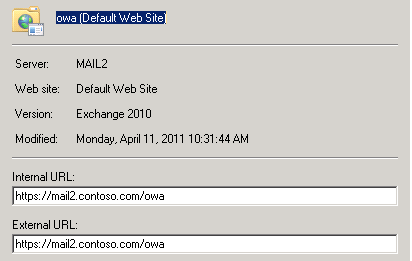 Next to "Outlook Web App", right-click "owa (Default Web Site)", select "Properties". 5. 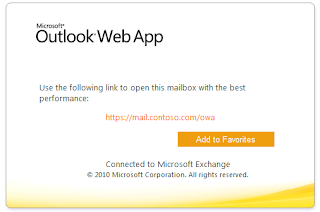 Make sure the External URL is "https://mail.contoso.com/owa". 7. Make sure "Use forms-based authentication" is selected. 9. 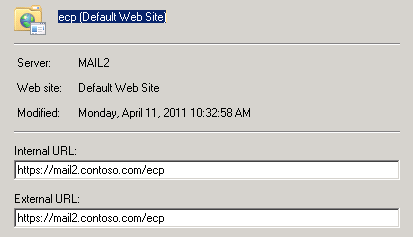 Next to "Exchange Control Panel", right-click "ecp (Default Web Site)", select "Properties". 10. 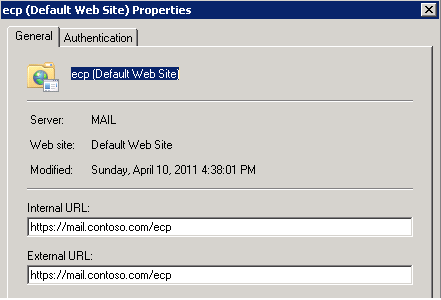 Make sure the External URL is "https://mail.contoso.com/ecp". 12. Make sure "Use forms-based authentication" is selected. 14. 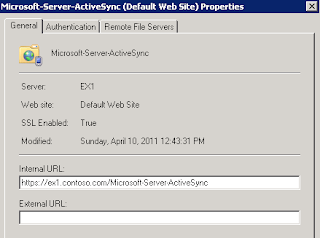 Next to "Exchange ActiveSync", right-click "Microsoft-Server-Active-Sync (Default Web Site)", select "Properties". 15. 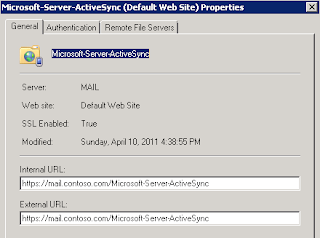 Make sure the External URL is "https://mail.contoso.com/Microsoft-Server-ActiveSync". 17. Make sure "Basic authentication" is checked. 19. Enter "iisreset" in "Command Prompt". 20. 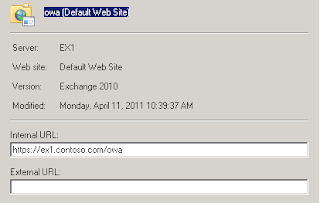 Still in Exchange Management Console, select "EX1". 21. 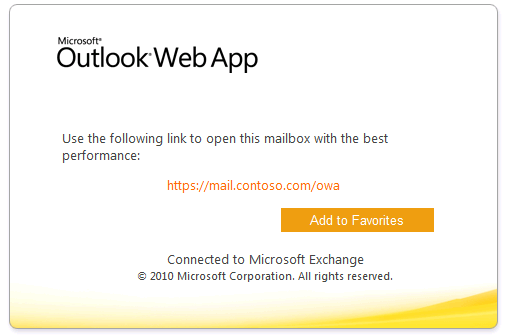 Next to "Outlook Web App", right-click "owa (Default Web Site)", select "Properties". 22. Make sure the External URL is empty. 24. Select "Use one or more standard authentication methods". 25. Check "Integrated Windows Authentication". 27. 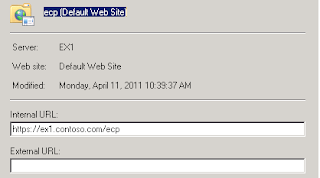 Next to "Exchange Control Panel", right-click "ecp (Default Web Site)", select "Properties". 28. Make sure the External URL is empty. 30. Select "Use one or more standard authentication methods". 31. 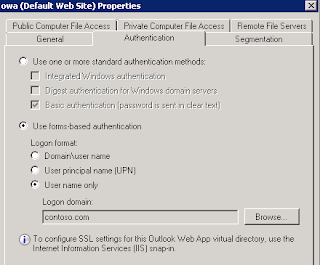 Check "Integrated Windows Authentication". 33. 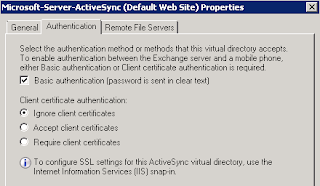 Next to "Exchange ActiveSync", right-click "Microsoft-Server-ActiveSync (Default Web Site)", select "Properties". 34. Make sure the External URL is empty. 37. Enter "iisreset" in "Command Prompt" of EX1. 38. Repeat step 20 -37 on EX2. 1. At EX1, launch "Internet Explorer". 3. Log in as Peter Pan. 4. At Ex2, launch "﻿Internet Explorer". 6. Log in as Susan Tam. 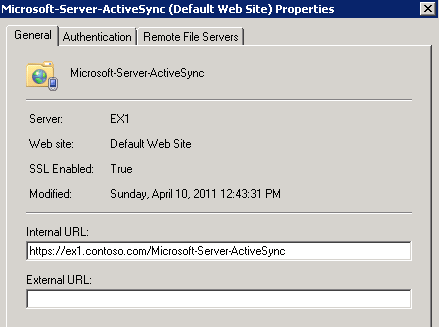 As a result, Client Access Server proxying is working fine. 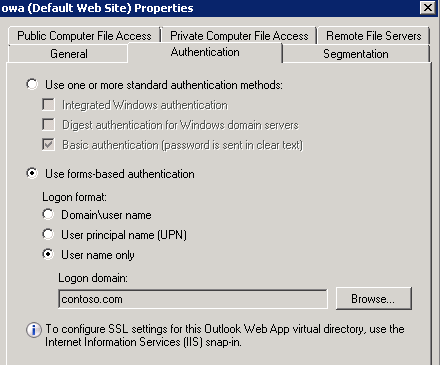 Outlook Web App users who access an Internet-facing Client Access server in a different Active Directory site than the site that contains their mailbox can be redirected to the Client Access server in the same site as their Mailbox server if that Client Access server is Internet facing. 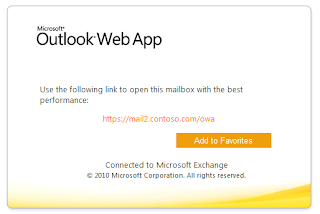 When an Outlook Web App user tries to connect to a Client Access server outside the Active Directory site that contains their Mailbox server, they'll see a Web page that contains a link to the correct Client Access server for their mailbox. I will add Mail2 in the existing environments. Assuming 2 sites are the internet-facing site. 1. 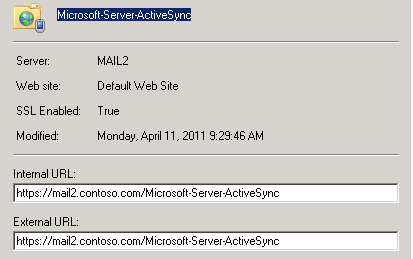 At Mail2, log in as Domain Administrator. 3. 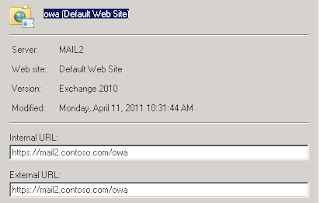 At right pane, select "MAIL2". 4. Next to "Outlook Web App", right-click "owa (Default WebSite)", select "Properties". 5. 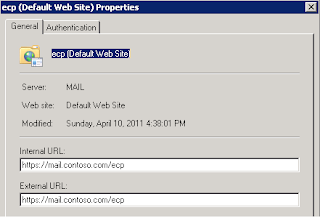 Make sure the External URL is "https://mail2.contoso.com/owa". 10. Make sure the External URL is "https://mail2.contoso.com/ecp". 14. 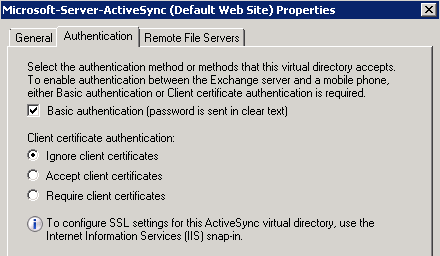 Next to "Exchange ActiveSync", right-click "Microsoft-Server-ActiveSync (Default Web Site)", select "Properties". 15. 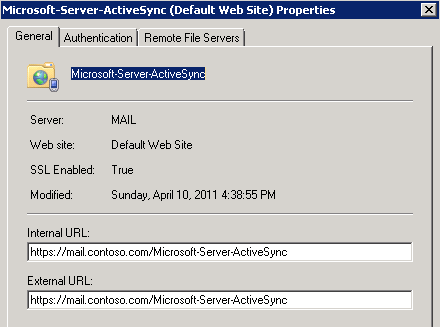 Make sure the External URL is "https://mail2.contoso.com/Microsoft-Server-ActiveSync". 19. Enter "iisreset" in "Command Prompt" of all Exchange Servers. 1. At workstation, launch "Internet Explorer". Peter is redirected to branch site Client A﻿ccess Server. 4. Launch "Internet Explorer" again. Susan is redirected to Default-First-Site-Name site Client ﻿Access Server. As a result, Client Access Server redirection is working fine.